Click on a link or save and download to desktop first. This is a generic manual which has been designed for use Australia wide. The manual is aimed at communities wanting to start their own turtle monitoring program but don’t know where to begin. The manual outlines various methodologies, equipment and datasheets which can be used, as well as expected outcomes. A great tool if you’re new to turtle conservation and monitoring! The introductory CDROM is the first step in training volunteers. This is followed up with field based sessions and a competency assessments to ensure that data collection is accurate. This CDROM provides a great overview of monitoring procedures. The field guide outlines the methods, protocols and field conditions used by the Ningaloo Turtle Program. If you have registered as a volunteer it’s a good idea to look at this manual before you get to Exmouth. It will give you a good idea of what is involved in turtle track monitoring. The Volunteer Trainer’s Guide gives instructions on preparation and training of volunteers. 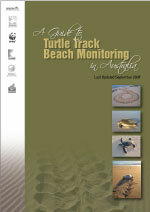 This is a useful tool for those wanting to train a group of volunteers on how to undertake turtle track monitoring. It provides detailed explanations of methods, terminology and assessments. This manual is used to educate and prepare volunteer trainers. The Train the Trainer handbook outlines example training sessions, equipment required and example assessment sheets.